Mixed antenna for BIII (174-230 MHz) and UHF (470-790/862 MHz) reception. In “790” version LTE band is filtered out through the design of the antenna, so the frecuency range of UHF band is 470-790MHz. The UHF section is a triple Yagi antenna consisting of an special “doble U dipole”, a corner reflector, and director which are distributed into 3 stacked Yagis fed in phase to obtain better gain, high directivity and well balanced bandwidth. The arrangement on th 3 Yagis cancels the power radiated either towards the ground or to the sky. 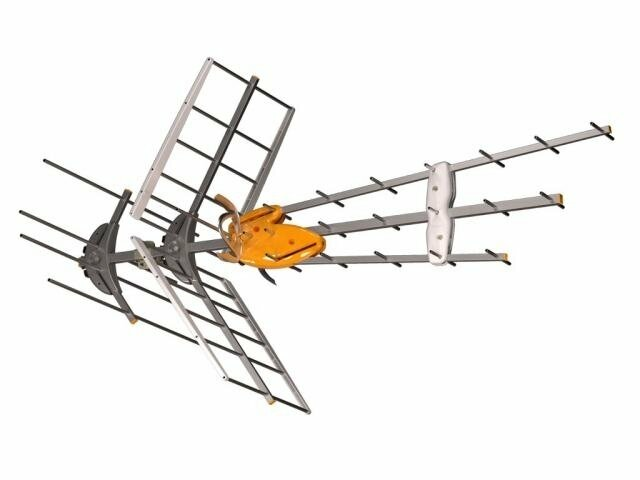 The BIII section is also a Yagi style antenna of 3 elements, with 1 dipole and 2 reflectors. The structure is based on the well known DAT HD antenna with additional BIII elements. The BossTech is activated or not depending on the power supply voltage. The regulation of the gain affects both signals to the VHF and UHF. Made of alluminium for long life.